Efe and I have had to travel to our state capital, Asaba, to get our Nigerian passports renewed. It has cost us far more than it should at over a hundred dollars each. Efe thought it best we use a middleman in the immigration office to cut through the bureaucracy and expedite the process. It can take several full days spent at that office before one can obtain a passport. Mr. Tijani is our middleman. He is a fair, cherub-faced Hausa man with deep horizontal scars across his face. It is hard for me to decide whether I trust him or not, much less whether I like him. He has taken quite a bit of our money, and even that we negotiated down from what he originally asked when he found out that I was an Oyibo and not a full-blooded Nigerian. At the immigration office, an albino officer called me in for interrogation. This wasn’t supposed to happen with all the money I had paid. I went in, Efe accompanied me (he was extremely nervous about the whole thing), and the officers didn’t seem to be too comfortable with his presence either. We were all uncomfortable. They asked me whether I was a Nigerian. I said yes. By what right, they asked: was I married to a Nigerian? They glanced at Efe. “No, he’s my cousin. We share a last name because his father and my father are brothers. My father is a Nigerian.” They asked me from what local government area and I answered with ease. They seemed surprised at this. All my documents were correct. We had spent a good couple of days in April going round to get them. I now have a certificate from my local government authenticating me as native to Ughelli South Local Government, as well as a drivers license (obtained by yet another middleman who was much easier to deal with), and an affidavit on my paternity from my cousin who is a civil servant in the Ughelli South Local Government Area. After some consultation among themselves, the immigration officials called me for further interrogation; this time by a stout Hausa man with a thick accent. I could tell they had settled on making this process difficult. I was seething with anger over this, because Efe informed me in a text message that he actually slipped the Albino two thousand naira (my money) in the hope of getting him off our case. The stout officer began his questions. Why do you want a Nigerian passport? “I am a Nigerian. I should have a Nigerian passport.” But you don’t look like a Nigerian. “My mother is an American, and my father is a Nigerian.” I ventured to ask them, “What is a Nigerian supposed to look like?” He didn’t answer. Yes, but why do you want to have this passport when traveling with your American passport is so much easier? “I have come to do my fieldwork here, and establish my own social and professional networks for my future career. I would like to eventually buy a plot of land here and have a home I can come to from time to time.” Doesn’t your father already have a home? “Yes, but I would like to establish myself independently of my father. I plan to come and go.” He smirked at this. He didn’t seem to believe me. Clearly, he found all this amusing. 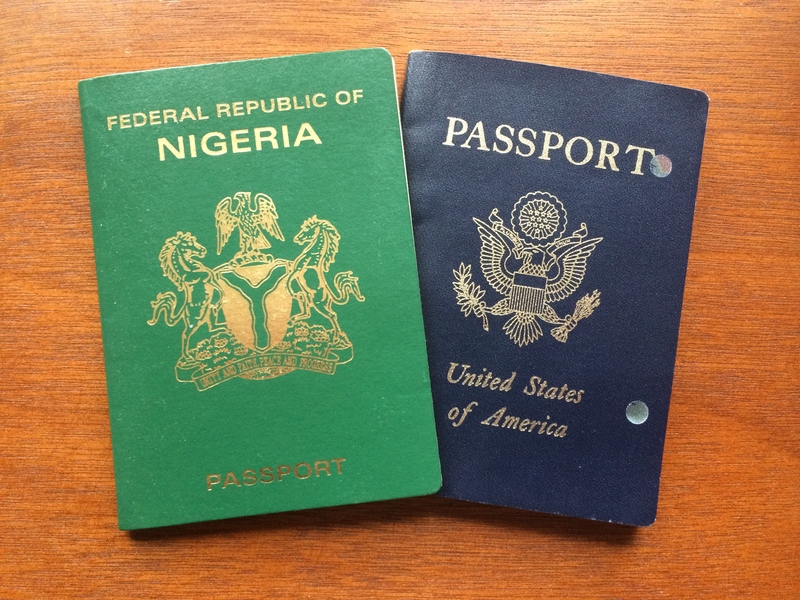 It is as if it was a joke that someone with the most coveted American passport would consider holding a Nigerian passport (shunned by most First-World nations). Or perhaps it was that I, an unmarried woman, should venture to establish myself independently of my father. After some silent deliberation, he decided that I would need to give proof of my father’s citizenship. I would have to give them a photocopy of my father’s Nigerian passport. This meant speaking to my father, who I had not spoken to in over a year. Is it worth it? I haven’t decided. I left with Efe feeling so angry at the whole system. So much money lost, and still things are made so difficult. The Albino and the Hausa man watched me walk away, gloating with satisfaction at the frustration they had inflicted on us, swollen with pride in the money they had extorted in the process. On our drive back, on the freeway leading out of Asaba, we passed a dead, bloating body laying on the side of the road; a man with a yellow shirt. He was just there, lifeless on the side of the freeway. His body had clearly been there for some time, with rigor mortis and the vultures ready to begin their work. It is not the first time I’ve seen a dead body on the side of the road. It is not easy to write about this; not easy to think through. How did these people die, and why had nobody (including me), especially the state, been moved to dispose of their lifeless bodies properly? Efe and I speculated that the man may have been homeless and was hit in the night by a vehicle and left there to die; or he may have been involved with criminals, or perhaps he was involved in the recent politics of the elections. Who knows? Everyone, including me passed this man’s body and we do nothing about it. I don’t know what this says about the value on human life here…or if it is any indication of value at all. People die here everyday without any claim on, or identification of their bodies. The Nigerian state does not, perhaps cannot, keep track of its citizens. Why bother to get a Nigerian passport? What does it really mean in the scheme of everyday life here, when a person can be missing, be dead and no one (not even the police…and they are ubiquitous on the roads here, busy extorting hard-working citizens) cares to search for him or her? There are more questions to ask, but my anger and despair is choking my ability to think through this further today. How can I claim to belong to such a place? Smith’s insights are always precise, yet softly human. I admire her ability to capture the nuanced complexity of the conundrums of existence we all deal with, in this 21st century world.